While most of the results are in from the 2018 midterm election, I’m interested to see how things shake out in Maine, which made history on Tuesday by using ranked-choice voting (RCV) to elect its members of Congress, a first for any state. Ranked-choice voting (also known as instant-runoff voting) allows voters to select as many candidates as they want by order of preference. The first round of counting eliminates the candidate who receives the fewest votes, after which the votes of her first choice supporters are reallocated to the remaining candidates based on those voters’ second choice. This process repeats until one candidate receives more than 50% of the vote. RCV may end up deciding a hotly contested Maine Congressional race. As of November 8, incumbent Republican Bruce Poliquin leads with 46.2% of the vote, followed closely by Democratic challenger Jared Golden with 45.6%. 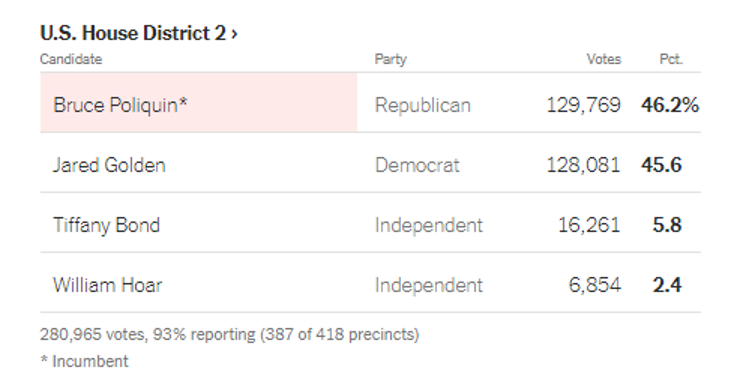 Unless a surge of first-round votes materializes for Poliquin or Golden, this race will be decided in the second round by the voters who chose independent candidates Tiffany Bond and William Hoar, who respectively received 5.8% and 2.4% of the first round vote. Maine’s flirtation with this system stems from the state’s peculiar (by American standards) political culture. While it looks like this year’s gubernatorial race has been decided in the first round, with Democrat Janet Mills winning 52% of the vote, prior to 2018 the winner of Maine’s governorship had not received an absolute majority of the vote since Independent Angus King won reelection in 1998. Prior to Janet Mills, Angus King was the only Maine governor to win majority support at a general election since 1982. This is due to Mainers’ fondness for third party and independent candidates like King. Indeed, prior to Tuesday you’d have to go back nearly 40 years to find a gubernatorial race in which a major party candidate won a majority of the vote in Maine. Frustration at this state of play prompted supporters to put an RCV initiative on the ballot in November 2016. When voters approved that initiative opponents sued in court to block it. The state legislature also passed a law to delay it. In response to these developments, supporters placed another initiative on the June 2018 primary ballot to veto the legislature’s actions, which passed easily. That initiative’s passage meant that going forward Maine’s Congressional elections will be decided by ranked-choice ballot, starting with the one that took place on Tuesday. Voters down under probably look at the rigmarole in Maine and wonder what all the fuss is about? Aussies have been using RCV in their federal elections for 100 years. A form of the system is also used to elect presidents in Ireland and some local offices in Minneapolis, San Francisco, and Takoma Park, Maryland. It will be exciting to see how things shake out in Maine. Who knows? Maybe in a decade the whole country will switch to RCV and wonder, with the Australians, what is the fuss all about?